Mom and I figured that plenty of time had past since our notorious visit to the Newport Grand Grille on July 7 (see review below). Since we were feeling lucky and wanted to play the slots, we figured that today would be a perfect day to see how improved the service had become after all the hoopla that went down last year after our dining experience. 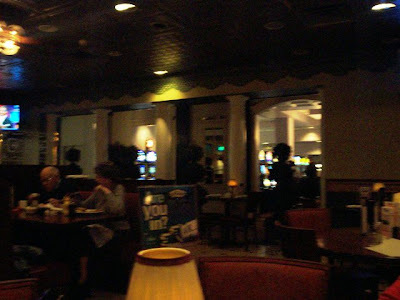 We arrived at Newport Grand at around 3:30 p.m., but stopped off to play some games first. Luckily for me, the $20 I lost almost immediately came right back to me within minutes. Not wanting to lose it again, Mom and I took off and headed for the dining room at around 3:45-4 p.m.
SIDE NOTE: A lot has changed at Newport Grand. It seems that all the machines have gone up in both price and lines. For example, I love playing this Red, White, and Blue Firecracker slot. The game used to have five lines at five cents. Now there are nine lines at ten cents. I guess with all the economic drama we're all facing, the casino was forced to up the prices. When we arrived at the dining room entrance, we were greeted by a very polite hostess who we had never seen before. She showed us to - believe it or not - the very table that we complained about the last time. Not wanting to make a scene, or cause anyone to remember who we were and promptly spit in our food - we shut our mouths and sat there, staring at our menus. Boy, talk about a price jump! Everything seemed to go up between $2-5. Maybe the casino isn't doing so well? I hope not. We really like it here. Soon after we decided what we wanted, a waitress named Kelsie came over to take our order. 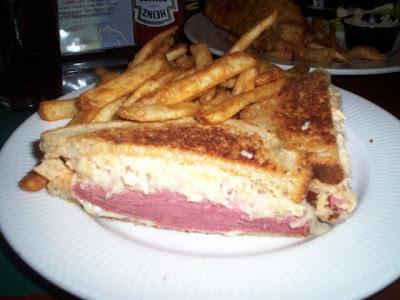 Mom chose her favorite - the fish and chips ($14.95), while I chose the Reuben with fries ($10.25). We also ordered two Diet Pepsis. Usually when we visit the Grand Grille, the food takes a while to come out. Mom and I don't mind because we know that all the food here is prepared fresh, so it's worth the wait. This time, however, the food was delivered quickly. My guess is that it really doesn't take that long to fry a piece of fish and slap a sandwich together. Kelsie brought over the two dishes, and warned us about the hot plates. Both meals looked amazing. With the steam floating away from the plate, Mom was in heaven (she just loves a hot dish). The fish was a nice large piece - not only long, but thick. Even despite its thickness, it was perfectly done, and couldn't have been better. The batter was light and crisp, not at all greasy, and the fish fell apart with flaky tenderness. 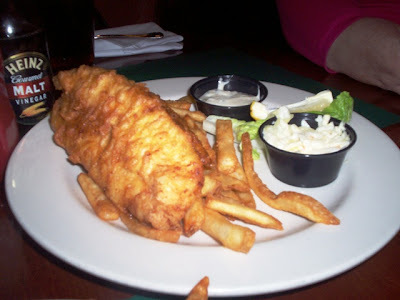 The Grand Grille really has one of the best fish and chip platters around in Mom's opinion. Her fries were crisp, light, and not greasy. She said the whole meal was delicious. Mom loves this dish so much that even though it went up in price, she would get it again. My Reuben was fabulous. I think I scarfed it down in a matter of minutes. The corned beef was like buttah. It literally melted in my mouth and had no icky pull to it (God, I hate that). I was a bit nervous seeing all the sandwich meat stacked up in the bread like that, and I was very thankful that it was prepared so well. The Thousand Island dressing and sauerkraut were very tangy, and the Swiss cheese wasn't too gloppy. The only minor thing was that the rye bread got a little soggy, but I doubt there is a way to stop that from happening since the dressing and sauerkraut get soaked into the sandwich. My fries were amazing, although they really did give me a lot (I couldn't finish them). I would definitely recommend this sandwich to any Reuben fan. It was amazing. *I assume this means food and beverage tax. We left $38.50 on the table for Kelsie which included a 20% tip. She really provided excellent service, and we really did notice an improvement with the other servers/hostesses. Before leaving, I filled out the comment card that asked how our experience was. We signed it "New England Bites," so we hope that the people at Grand Grille know that we've been back, and definitely enjoyed our visit. We can't wait to return again, especially now that we know that the customers are being treated well, and the food is still fabulous ... even though the prices went up. PS - Just as Mom and I were down all the money we had decided to spend (a.k.a., lose at the slots), we won it all back!! It was definitely our lucky day. ***SECOND UPDATE*** -- I received a personalized e-mail from the Food and Beverage Manager, Joe Caruso, regarding the poor service that went down on July 7. He left me his phone number which I promptly called on the afternoon of July 12. He told me that he was actually in a meeting about the service situation, and that he would call me back ASAP. I was surprised to hear that they were actually discussing me, and was anxiously anticipating his return phone call. When Mr. Caruso called back, he thanked me for my great article, my honesty, and also apologized for the service. He said that there were many changes being made regarding service, and he's sure that everyone is now on the same page regarding customer satisfaction. He seemed very confident that the situation had been addressed, and I completely believed him. He told me of his background in customer service and assured me that what took place on July 7 would not happen again. He then offered us a meal on the house, which was very surprising. I have no doubt in my mind that everyone at the Grand Grille is on the right track and is going to put the customer first from now on. I can't wait to go back! Our Food and Beverage Manager will look into your experience with us. If you like this the food…..we have Daily Dining Deals in July. We look forward to having you back again soon for great food and improved service. *sigh* -- Oh well. So much for an apology. Today is July 7, 2007. In other words, 7-7-07 - the luckiest day in existence. Couples are getting married, people are buying lottery tickets and today, like many others, Mom and I decided to try our luck at the slot machines inside Newport Grand. After all, we had to win something, right? It was a lucky day! 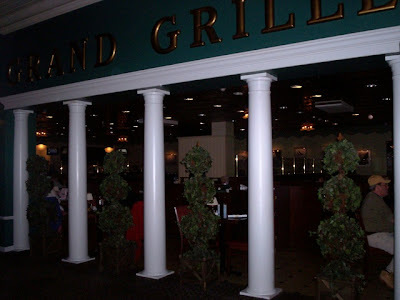 Plus, we would be dining at the Grand Grille, one of our favorite restaurants of all time. What could go wrong? We hit the casino around 4 p.m. and noticed a lot of cars in the parking lot. Saturdays are usually a busy casino day anyway, but today was special, and I was sure that there were some people in there for the same reasons that we were - the lucky day. We decided to pick up a Newport Grand Rewards card first, since we had not yet applied for one. The woman behind the desk was extraordinarily helpful and wished us good luck for the day. Mom and I then headed straight for a quick bite at the Grand Grille. When we first got there, the middle section of tables and the bar section was quite filled. There was an older couple waiting to be seated in front of us, and a few single diners standing behind. Quite a while went by before the hostess, a petite older woman with glasses, got around to seating the first two patrons. She sat them at a table which was in the center of the room, right next to a coat rack and behind the wait staff station. This table seems to put diners on display since it's right in the middle of all the "action," and I could clearly understand why the two diners, after being seated, moved over to an empty booth. If looks could kill, the hostess, and the glasses-wearing brunette that was to be their waitress, would have annihilated those two because they shot them both a death glare that was probably seen by just about everyone in the place. Mom and I were still stuck standing behind the "Please wait to be seated" sign while the hostess ran around with a handful of menus, and the would-be waitress stood by the bar socializing and washing several water glasses. Finally the hostess came around to us and dragged us to the same center table that the previous guests had rejected. I, in my most polite tone of voice, said, "Could we not sit here, please?" She ripped the menus off the table, huffed and puffed with disgust, and plopped the menus down on a table against the back wall. I was a bit taken back by how rude she was, but I still felt badly for making her walk a whole five extra feet, so I said, "I'm sorry." I even said, "Thanks," when our menus were slapped down on our new table. Hey, it's not our fault. We just didn't want to be sitting in the middle of the room like two pink elephants. Plus, there were other people waiting behind us. Surely one of them would want the table. Lo and behold, the next patron (when he was finally seated) occupied the table. Mom and I were now sitting and were still remarking on how long it was taking for the people waiting to actually get seated. A gentleman in a yellow shirt who looked like a manager took our drink order. He was quite polite, but he obviously looked he was just serving us to help out the flustered wait staff. Mom and I both ordered Diet Pepsi and proceeded to look over the menu. It was at this point that we overheard the waitress from the section with the infamous table exclaim things like, "What is wrong with people?! This always happens! My lunch is sitting back there. I don't get it!" I look up and see that the waitress had just been talking with the hostess, who was staring directly at us. Mom and I were obviously the subject of that conversation due to our requested table-swapping, but we should have never been subjected to actually hearing it first hand. What about the other customers? Were they discussing them as well? Well, as we found out throughout our lunch, they were. Little snide comments here and there, lots of dramatic sighs and pauses, stomping by with empty plates, slamming doors and things around, fake happiness when bringing the bill in hopes of a tip, etc., was all being done by this one waitress (the hostess seemed to disappear in the hustle and bustle of the restaurant). This waitress was even complaining to her boss, which seemed to be the guy in the yellow shirt. I don't know if he is just numb to her negativity, but he didn't say a word. He just stood frozen in silence as she aired her grievances about not getting to take a break. Even all the other waitresses were staring at her in awe because she was acting like such a drama queen. Waitressing obviously isn't for her, and I think it's time that she find a new profession because unfortunately, this is not the first time that we've seen this girl act like an overtired child before. Because we've been here so many times, and because we were ordering items from the menu that we've already tried, I wasn't even going to do an official review of The Grand Grille today (hence no photos). However, due to the rotten attitudes of some of its staff members, I decided to make an exception. When we were finally ready to place an order, a blonde waitress was summoned to our table by the guy in the yellow shirt. She seemed to be very rushed, but was still quite pleasant. Mom ordered the Fish and Chips Platter ($11.95) and I ordered the Willow Tree Chicken Salad Sandwich on Rye with Brew City Fries ($7.50). She took away our menus and Mom and I quietly sipped our Pepsis while listening to the pleasant sound of the nearby slot machines. The food at the Grand Grille is outstanding. Although we usually end up waiting a bit for our meals to arrive, this is quickly overlooked when we bite into our meals and taste how fresh everything is. We've had several scrumptious entrees and appetizers here, but our favorites are definitely the Nachos Grande ($8.95) and the New England Clam Cakes ($6.50). We've also had one of their speciality margaritas which was cool and tasty. The waitresses are usually polite, but they do seem a bit frustrated. Perhaps there aren't enough of them to handle all the customers, but honestly, when we've eaten here, the place has never been that busy. I don't know how some of these girls would hold up if they worked for a busy chain restaurant like Ninety Nine or TGI Friday's. Our food arrived, but it was brought to our table by Mr. Yellow Shirt. Everything was delicious, as we had hoped and expected. My chicken salad was cool and fresh, the bread was soft, and the veggies were crisp. Mom's fish was hot, white, and lightly breaded. It was quite a large piece of fish, and the fries that came with both platters were tasty and plentiful. The blonde waitress who took our order returned to ask how everything was. 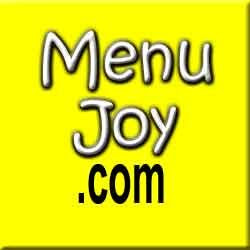 We were extremely pleased with the actual meal, so our mood was quickly changing from annoyed to satisfied. Although Mr. Yellow Shirt cleared away our dinnerware, Blondie reappeared with the bill ($25.11). I believe her real name was "Nicole," and that is (hopefully) who are 20% tip went to (although I was a bit confused on this because we were actually served by two pleasant people). We didn't want to take our frustration with other members of staff out on poor Nicole. After all, she had to deal with these people on a regular basis. Thank God we were only here for lunch. As we left, we noticed "Negative Nelly" walking around the restaurant with her purse, still complaining to the other servers. GET OVER IT ALREADY!!! What was this girl's problem? The Grand Grille will remain in our Excellent category because of the quality of food, the ambiance (dark, quiet, cozy), the interior (tin ceilings, candlelit tables, dark green decor), the cleanliness, and the proximity to some of our favorite games (Hoot Loot, Wheel of Fortune, Star-Spangled Firecrackers). However, these waitresses need to drop the attitude. Customers should never overhear them discussing other patrons, and their so-called "lousy" job. Waitress jobs are a dime a dozen; I'm sure they can easily be replaced. PS -- We didn't win on the slots. So much for a lucky day!